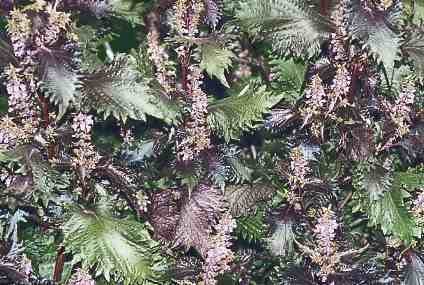 There are two variants of Perilla frutescens grown in Japan: The var. crispa, called shiso [紫蘇, しそ], has attractive, crispate foliage and is grown for the aromatic leaves, which may be green (ao-jiso, [青紫蘇, あおじそ]) or red (aka-jiso [赤紫蘇, あかじそ]). The leaves are always used fresh, but can be frozen. The other variant is var. frutescens known as egoma. It is valued for the oil extracted from the seeds, which is used for Shintoist ceremonies, but also as an expensive food supplement. Occasionally, the dry seeds find use as a spice. Aromatic but difficult to describe; the fragrance reminds me of cinnamon and anise or licorice. The taste is similar, but with a marked astringent component. As with many other plant of the same family, olfactory characteristics are quite variable and depend, besides genetic factors, also on soil and climate. Perilla leaves contain about 0.2% of an essential oil, which varies widely in composition. Several different chemotypes are known: PA (see below) is the only is the only one of culinary value; the others are PK (main component perilla ketone, minor components isoegomaketone and perillene), EK (main component elsholzia ketone, minor component naginata ketone), PL (main component perillene, minor components citral, perilla ketone, isoegomaketone), PP (phenylpropanoids: myristicin, dillapiol, elemicin, safrole) and C (main component citral, minor components perillene, perilla ketone, isoegomaketone). There is also a type rich in rosefurane, which might have potential as a cheaper substitute for rose oil in perfumery. In the most fre­quently culti­vated chemo­type (PA), the main com­ponent is perill­aldehyde (p-mentha­dien-1,8(9)-al(7), 75%) Its minor con­stituents are limonene (13%), linalool, β-caryo­phyllene, l-menthol, limonene, α-pinene, perillene (2-methyl-5-(3-oxolanyl)-2-pentene) and elemicin. Perill­aldehyde can cause skin allergies. The C type is a potentially interesting source of citral, a pleasantly lemon-scented material much used in the flavour and perfume industries; see lemon myrtle for more on lemony flavours and citral. The PP type may also gain importance as a source of simple phenylpropanoids in the pharmaceutical industry. The high myristicin content makes this plant considerably toxic (see nutmeg on the hallucinogenic properties of myristicin). The dominating constituents of the remaining types are monoterpenoid furanes, often ketones. Some of these, e. g., isoegomaketone, are severe pneumotoxins that have caused fatal poisoning in cattle repeatedly. The PK type must be considered a toxic plant that has no use in kitchen. The oxime of perilla aldehyde (perillartin) is about 2000 times sweeter than sucrose; it is used as an artificial sweetener in Japan. Perilla seeds con­tain a drying oil (40%) with high content of multiply unsaturated fatty acids (60% α-linolenic acid, 15% both linoleic and oleic acid); their medicinal value is sometimes matter of great exaggeration. 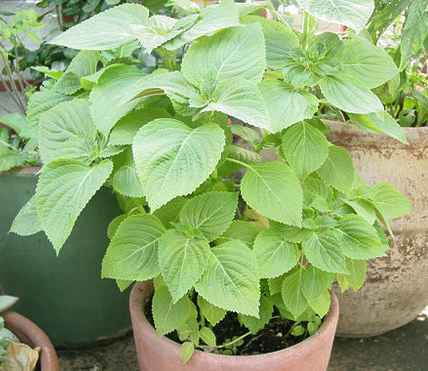 Lastly, perilla contains the pseudotannins and antioxidants typical for the mint family; see hyssop for details. The reddish–purple colour of some cultivars is caused by an anthocyanin pigment called perillanin chloride. The plant is native to South East and East Asia. I was not able to find out anything about the name perilla, although there might be a connection to pearl. 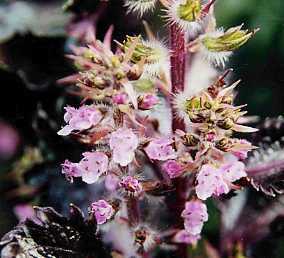 In Korea, where perilla is an important flavouring, the plant is known as tul-kkae [들깨]. This name literally means wild sesame plant , although perilla and sesame are not particularly closely related. Also kkaennip [깻잎] ( sesame leaf ) is a common designation for perilla in Korean. I do not know about the motivation behind those weird names; maybe, they refer to the fact that both plants have oil-rich seeds. Occasionally, names of the wild sesame type are found in Korean cookbooks published in English or German. It is to be suspected that the authors meant perilla and not a wild type of sesame. Also, the Japanese name egoma [荏胡麻, えごま] for perilla seeds is derived from sesame (goma) and means sesame bean . In some East Asian countries, perilla and rice paddy herb bear confusingly similar names. See there for details. 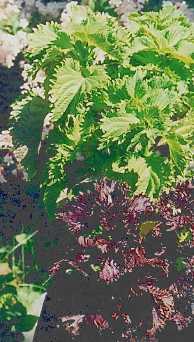 The aromatic leaves of perilla are popular in parts of the Far East. In Vietnam, for example, they are, among other herbs, frequently served as a fragrant garnish to noodle soups and spring rolls (see Viet­namese coriander). In Korean cuisine, they have found similar uses. 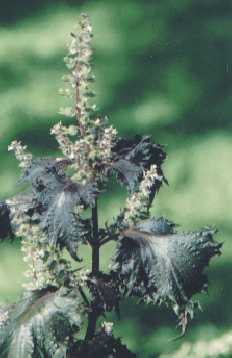 Perilla is one of the few aromatic plants that have estab­lished them­selves in Japanese cookery (shiso [紫蘇, しそ, シソ]). Other examples for Japanese herbs and spices, besides those named below, include Sichuan pepper, poppy and water pepper. In Japan, perilla leaves are used to garnish sashimi, the famous raw fish (see wasabi) and tempura [天麩羅, 天ぷら, てんぷら, テンプラ], a Portu­guese-influ­enced Japa­nese recipe. Basically, tempura is battered veg­etables (potatoes, carrots) or sea food deep-fried in diluted sesame oil. The secret lies in the very special batter, which is prepared with ice water and con­sumed im­mediate­ly, resulting in a unique, crispy, light, almost trans­parent coating. Perilla leaves can either be used as a garnish, or be battered and deep-fried for themselves. 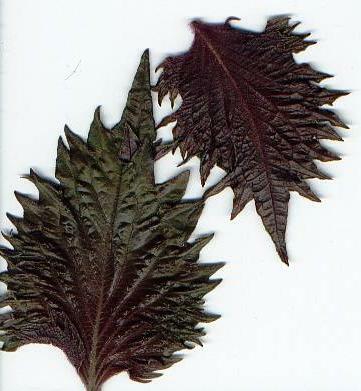 In Japan, perilla cultivars with red or purple leaves are preferred to add both flavour and colour to pickles. An example is umeboshi [梅干, うめぼし], a special kind of salty pickle prepared from unripe fruits similar to plum or apricot (ume [梅, うめ], Prunus mume). The liquid in which umeboshi has been prepared gives colour to the ginger pickle beni shoga [紅生姜, べにしょうが], which is eaten with soups and noodle dishes. See also annatto on the topic of food colourants. Of the Chinese cooking styles, only Hunan cuisine makes much use of perilla. It is mainly used for fish dishes, for which Hunan is famous. The leaves are not eaten raw as a garnish, but are rather coarsely chopped and added in the last phase of the cooking, to let them boil or steep for just a few minutes. In the West, perilla has not yet become very popular. 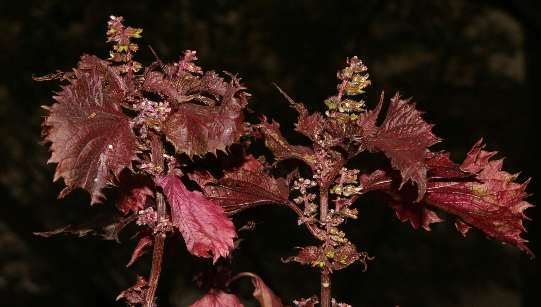 There is some potential of using the leaves for their subtle flavour, but red-leaved perilla is probably more interesting for its colouring capability. With red perilla leaves, one can achieve colours ranging from a pale pink to an intensive red wine hue. Technote Web design stuff, list of known bugs, feedback welcome!